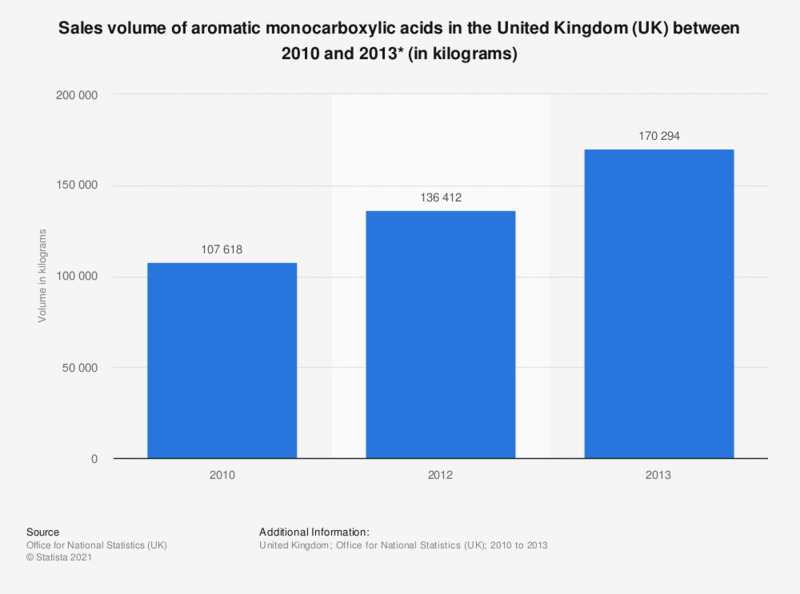 This statistic shows the sales volume of aromatic monocarboxylic acids based on PRODCOM estimates** in the United Kingdom between 2010 and 2017*. The UK experienced an increase in sales volume over this period. The sales volume reached 170.3 thousand kilograms in 2013. * Data for 2011, 2014, 2015, 2016, and 2017 was suppressed by the source. Aromatic monocarboxylic acids, their anhydrides, halides, peroxides, peroxyacids, and their derivatives excluding benzoic acid - phenylacetic acids, their salts and esters - benzoyl peroxide and benzoyl chloride.